Her birthday was celebrated on Christmas Day at her home with a few family and friends and a light lunch, birthday cake and ice cream was served, she opened her birthday and Christmas gifts. She had dinner with her children at their home later Christmas Day, and opened the remainder of her Christmas gifts. She grew up in the Mt. Zion AME Church of Midway and became a member of Pilgrim Baptist Church after marrying Mr. Willie Glover. 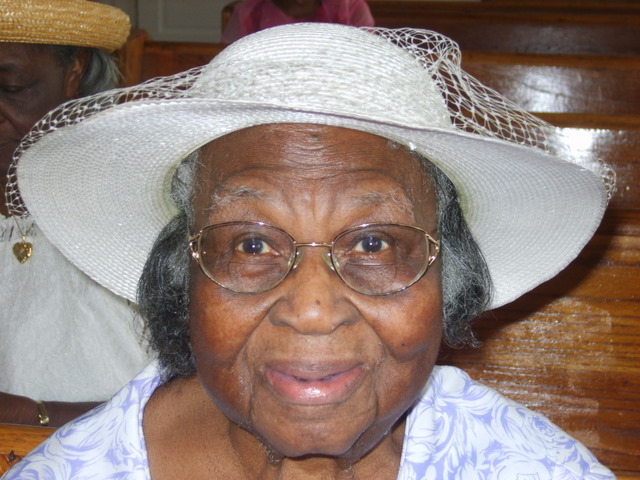 She served as a deaconess and was a member of the choir. She was a mother to the congregation and enjoyed preparing delicious meals and desserts for her pastors and their families. She and Mr. Willie were ideal hosts for their guests. Miss Maizie was a cook at the Carlise Military School in Bamberg, until she retired. She has been a loving and caring mother to her 2 daughters-in-law, Elizabeth and Martha, for over 50 years. Her grandchildren: James Willie “Jay” (deceased) Deidre; Thomas, Jr. Darryl Jonathan; Zachary Frazier, Jason Mark; loved to go to gramma and granddaddy’s house as children, and would request “fried chicken, and macaroni and cheese” every day. They also spent many days following their granddaddy to the fields and the woods for fun activities, and Miss Maizie was always ready with food and activities for her grandchildren. Miss Maizie welcomed her grandsons wives: Freda, Sonya, Adrienne and Kaye, when they became family members and presented them with one of her artistic quilts. She also has 9 great grandchildren; and is still calling the little ones “momma sugar.” Since she moved to Augusta more than 13 years ago she joined the Macedonia Baptist church where she attends Sunday worship services, weekly Bible study and is a regular member of the Women Sunday School Class. She attends Carrie Mays Community Center the senior activities and participates in physical and group activities. She has shared some of her quilting secrets with the group and they have also been hooked on her macaroni and cheese. Miss Mazie continues to be the same loving and caring person whenever you see her. Say hello and happy belated birthday to her. You are currently reading 98th Birthday Celebration at JUST LIKE FAMILY.